TERROR NIGHTS is based on my books TERROR SCROLLS and I HAVE A DREAM found at http://www.fdelery.com. Hopefully, Part II will define some of the keys of the Scrolls that the scholars are divining. The star of the book, Joe, may just be a homicidal maniac. Here is a picture from the past in my football days. Not too many years after this picture, I lead our school football team to an undefeated season. I was the quarterback (Drew Brees in the making). That is I on the left..
NEW ORLEANS (Delery Gazette) — From an article entitled CREOLE BEAUTIES OF THE 1940S & 1950S at the CreoleGen website a family friend found this picture and story about my Aunt Berenice Delery Moret, my dad’s sister. The picture and story are amazing to me. I sure would like to share it here with my readers. Pretty Berenice Delery was pictured in the Xavier Herald of December 1945 when she was a sophomore in the College of Liberal Arts. 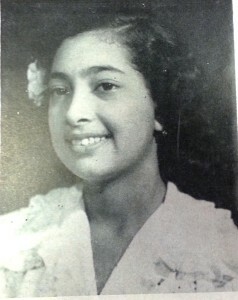 As a native New Orleanian, she lived at 1906 Annette Street with her parents, Ferdinand Delery, Sr., Beatrice Patterson Delery and several siblings. While at Xavier, she was an active member of the Sodality of Our Lady and one of the ranking students of her class. She married Mr. William Rouege. After his death, she became the wife of Mr. Calvin Moret of New Orleans. Sources: The Louisiana Weekly, 27 Feb. 1942 p.4+ 05 August 1944 p.4 + 13 Oct. 1945 p.1; 05 Nov. 1949 p. 1+ 13 Nov. 1954 p.1+ 01 Sept. 1956 p.1; Xavier Herald, Xavier University Archives & Special Collections, Dec. 1944 p. 6+ Dec. 1945 p .5; Ancestry.com (census records, etc). NEW ORLEANS (Gazette) — Looking for Nicole Kidman’s latest movie. I read that her movies have earned more than $3 billion in her career. I truly hope that she wins an Academy Award for her latest releasing film Grace of Monaco which opens in 2014. I flipped through the list of her movies Kidman Movies Filmography and came to realize that Nicole is a “beast” in the movie industry. Her work is marvelous. I think (and hope) that her performance in Grace of Monaco will again show the world that she is at the top of the list. Speaking of movies, I need to once again make another push for one of my books to be picked up as a movie. In fact, I have been writing and working on publishing a screenplay for one of my books. I have had some nibbles and inquiries about doing a movie about one of my books. How do they say? ..I have to put my shoulder to the grind in order to step up to the next level. Have you ever wondered why crocodiles have existed on earth for so many millions of years? Scientists believe that their intelligence and keen sense of survival have paved the path for crocodiles to be one of the longest living species on earth.